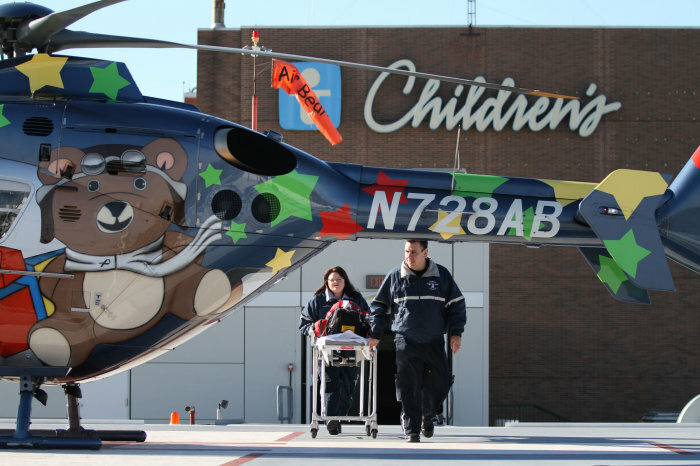 Evan loves the toy helicopter Akron Children’s medics gave him after his Air Bear ride. While Evan gets great joy from it, his parents can’t help but be reminded of the most harrowing experience of their lives. Sometimes it’s what you don’t know – and what you can’t control – that’s most difficult; particularly when it involves your own child. “He just wasn’t being himself; you could tell he seemed off,” she said. She and her husband Joe monitored his symptoms, which included fatigue, sluggishness and lack of appetite. After several hours, it worsened into labored breathing and retractions (sucking in of the skin around the ribs and sternum), so they took him to the Beeghly campus ER. Doctors there measured Evan with a pulse oximetry level of 88 percent, concerningly below the normal range of 95-100, and immediately started him on an oxygen treatment. When he didn’t respond quickly enough to that, they ordered an emergency helicopter flight to Akron. Weight restrictions on the helicopter meant only one parent could accompany Evan on the ride. “We let him choose and he chose dad, which made me cry a bit, but whatever made him comfortable I was going to be OK with,” Anna said. “Well that night he got to fly and see his moon really, really big out the window. That’s his biggest memory of it,” she said. While Evan and his father were in-flight to Akron, Anna shouldered the worry. She ran home and gathered some essentials knowing they’d need to stay in Akron. She also had to quickly make arrangements with family to watch Evan’s twin brother, Ethan. Twin brothers Evan (left) and Ethan with parents Joe and Anna Soltesz, of McDonald. That one-hour drive from Youngstown to Akron was one of the longest of her life, she said. Evan spent 24 hours in the pediatric intensive care unit before his breathing was stabilized, and 5 days total in the hospital. 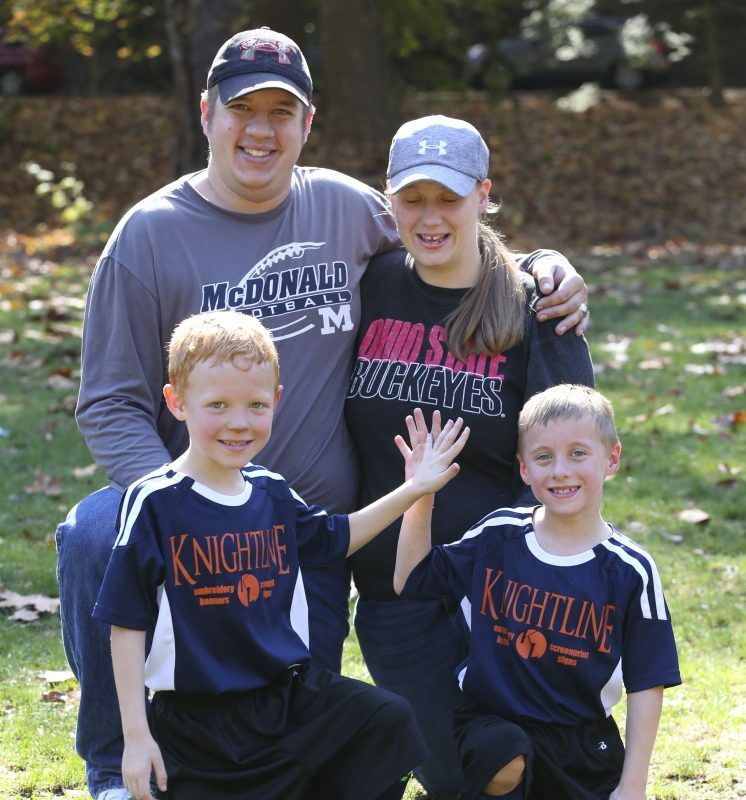 He went home with an asthma diagnosis, which he continues to manage today with an inhaler and various medications, as well as twice-per-year visits to an Akron Children’s pulmonologist in Warren, just a few miles from his home. The family credits Akron Children’s asthma education specialists for the information they were provided before they left the hospital. Both mom and dad also suffer from asthma, and learning about triggers and other helpful tips has proven invaluable. 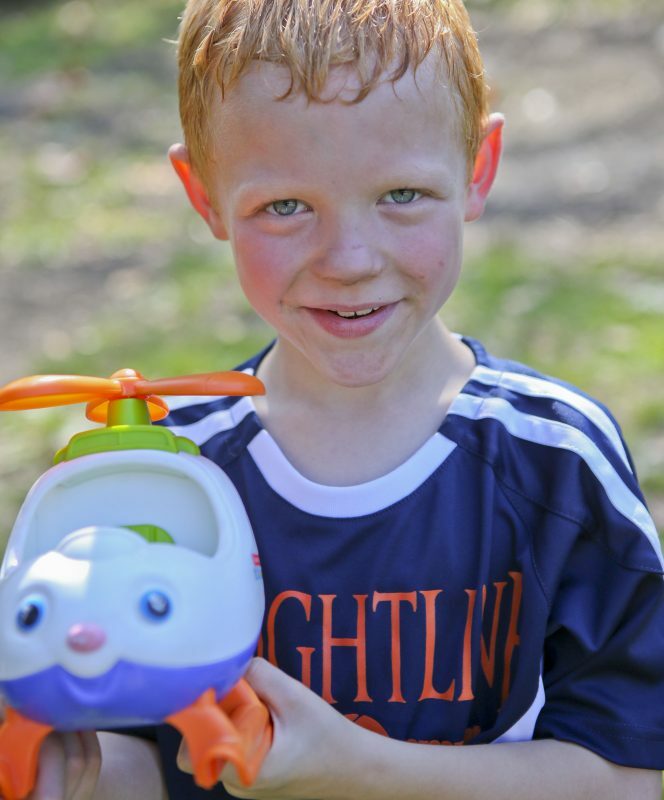 Evan and his brother play soccer, and love to run and ride their bikes. Evan, his parents say, has learned to recognize his limits and manage his own symptoms when he gets short of breath. 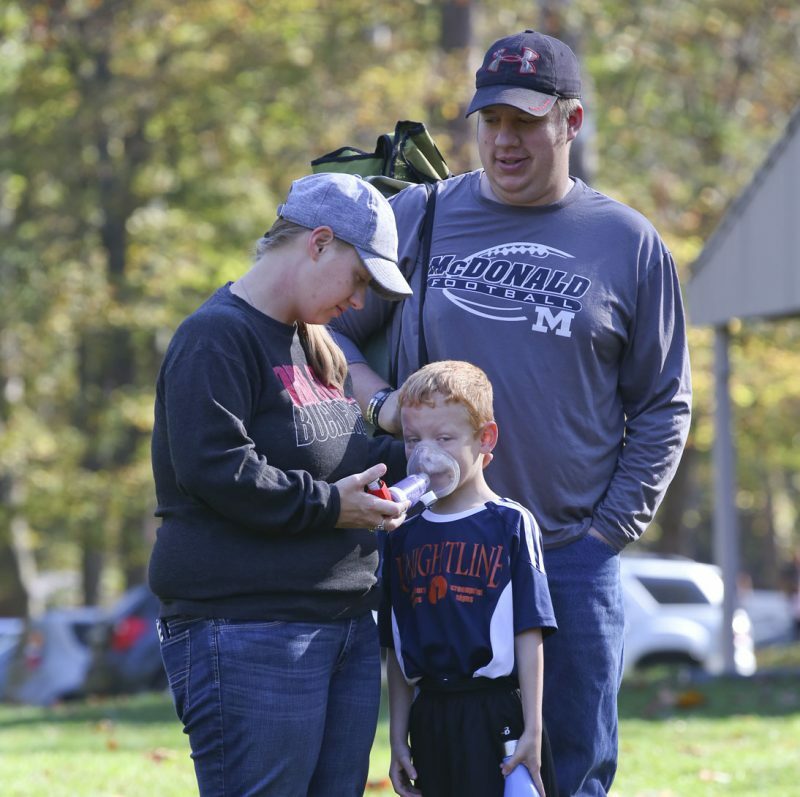 Anna helps Evan manage asthma symptoms during a soccer game. Evan, who wants to be a firefighter someday like his dad, still plays with the toy helicopter Akron Children’s medics gave him after his Air Bear ride. While Evan gets great joy from it, his parents can’t help but be reminded of the most harrowing experience of their lives. 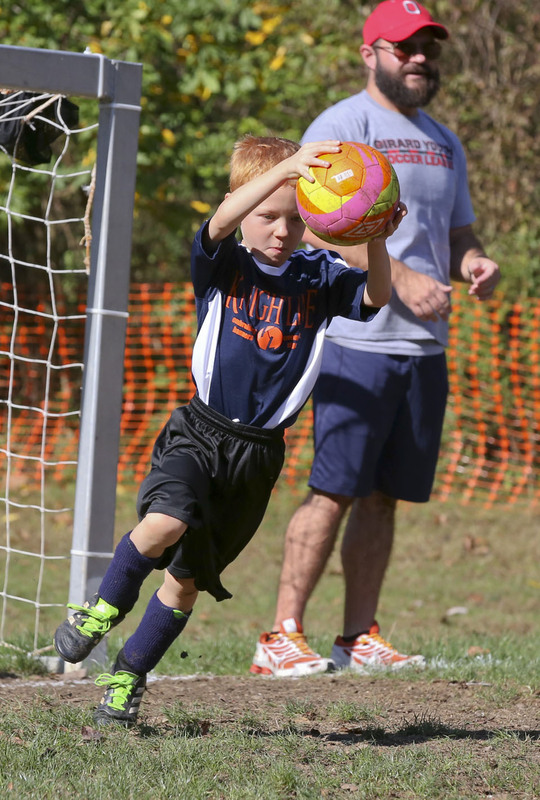 It’s tough to get one past Evan when he’s manning the goal.